Today I am here with Green Peas Kachori served with spicy dum aloo. 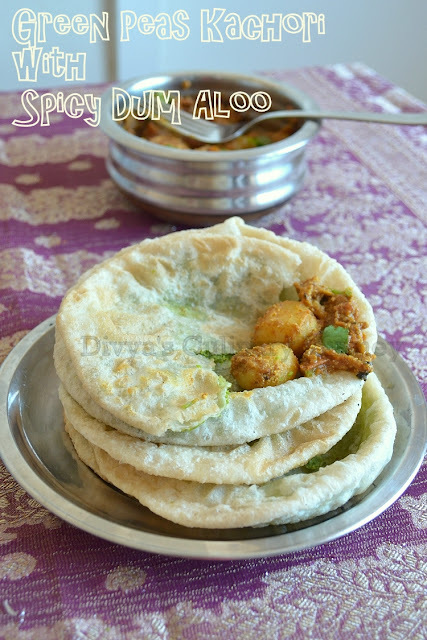 I tried this recipe from fellow blogger Sanoli's space. This is a bengali style dish also known as Koraishutir Kochuri aur Aloor Dam. Kachori is stuffed with spicy green peas filling and is deep fried and served with spicy baby potatoes. It tasted great and my daughter loved it so much. In a bowl combine all purpose flour, oil,salt and add water little by little and keep kneading till you form a smooth dough. Keep it covered and let it rest for at least half an hour. To prepare the green peas filling- coarsely grind the green peas, ginger and green chillies. Then heat oil in a skillet, add fennel seeds and then asafoetida and fry for a minute, then add the ground peas mixture. Mix well. Then add cumin powder, garam masala powder and salt to taste and mix well. Keep stirring the mixture in medium low heat until all the extra water evaporates and mixture becomes dry. Then turn off the heat and roll the mixture into small balls and set it aside. It yields 12- 14 balls depending on the size you roll. Now take the resting dough and roll it into small balls. Then roll it into small disc, place the prepared peas balls in the centre and cover it such that it is completely covered. Then roll it again gently till the you get the required kachori shape. Heat oil and deep fry the kachori till they are golden brown on both sides. The kachoris will puff like pooris. Remove from oil, drain the excess oil in a paper towel and serve it warm with Dum Aloo or any other curry of your choice. Boil the potatoes and peel the skin. Then heat oil in a skillet, fry these potatoes till they turn slightly golden brown. Then set them aside. In the same skillet, add the fennel seeds, cloves, cinnamon stick, bay leaf and fry for a minute or two. 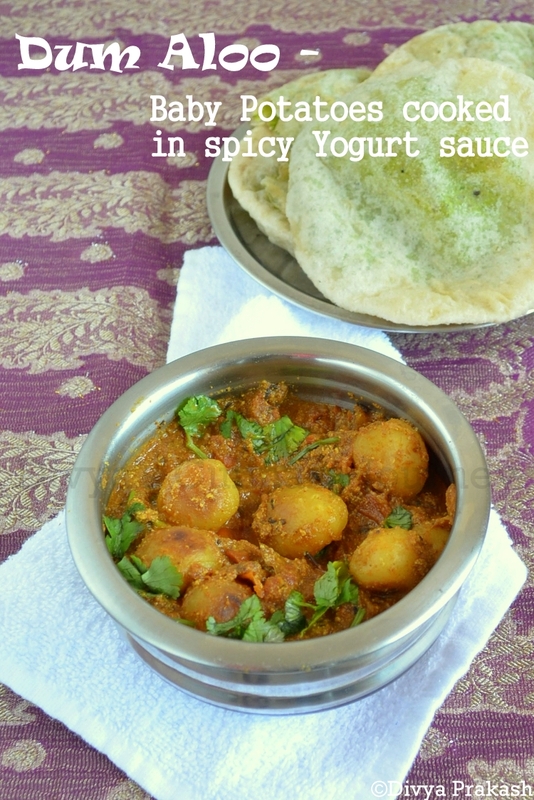 Then add asafoetida, tomatoes, grated ginger, green chillies and fry for 2-3 minutes. To this add turmeric powder, chilli powder, coriander powder, and garam masala and mix well and let it cook for few minutes till oil starts seperating on the sides. Then add the potatoes, mix well and cook for 3-4 minutes. Then add yogurt mix well and add water to get the required consistency and check the salt and bring it to boil and reduce to simmer for few minutes and then turn off the heat. 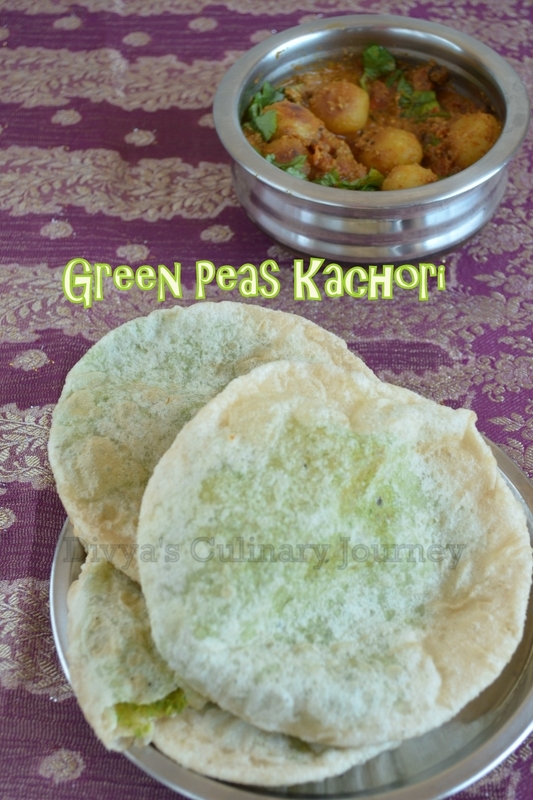 Serve it with Green Peas Kachori, or any bread of your choice. yumm yummmm lovely clicks.. 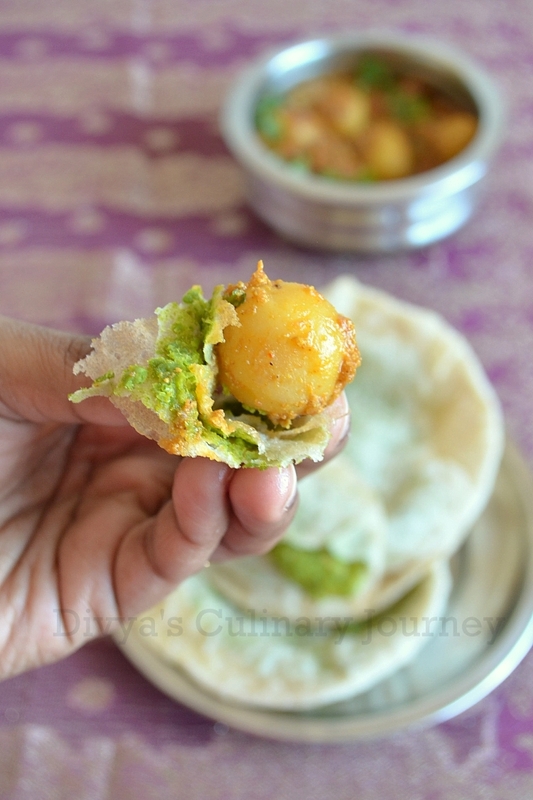 Tempting me divya ..
Kachori and dum aloo looks yumm, Tempting me to make one. Nice clicks. 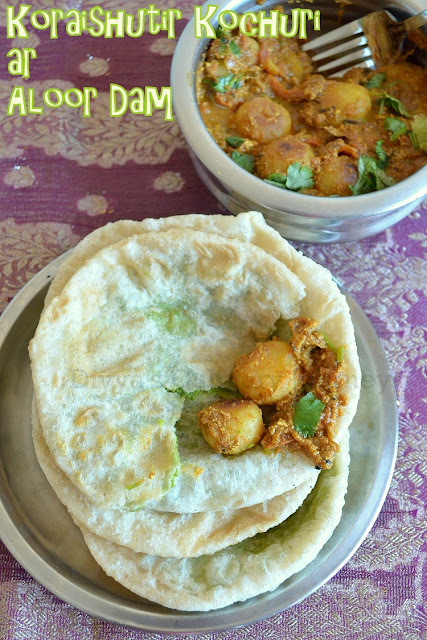 kachori with dum aloo is my fav combo dish. it looks very inviting and yummy. Well Done Divya, very lovely clicks. Super clicks , looks so tempting. very very yummy... enaku ootivida oru click eduthingala... mm i tasted its fabulous..
ippadi kaikku ettiyathu vaayiku ettalaiyee. liked all your clicks divya.. best combo with kachori.. The third click is too tempting Divya, feel like taking it right off your hand..
looks so tempting n loved the 3rd click!! Such a killer combo na,if Sanoli would have nt challenged us we would have never thought of this combo na, beautifully done Sis..Makes me drool again. Saw this on your fb page and thought it looked lovely. And you made them both as a combination. What a delightful meal. Yummy delicious and presentation is nice..
YUmm Divya... you made perfectly Dear... really a tempting combo. Lovely pic love the way you have showed the potatoes close in your pic. Lovely job divya. Wow looks so yummy..nice combo, nice clicks. !